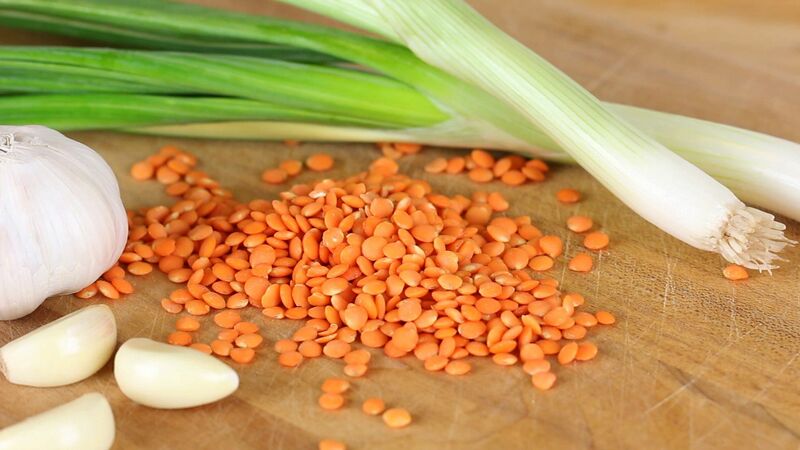 Lentils are definitely a “ohh, yes” ingredient for babies for several reasons: they are loaded with proteins. 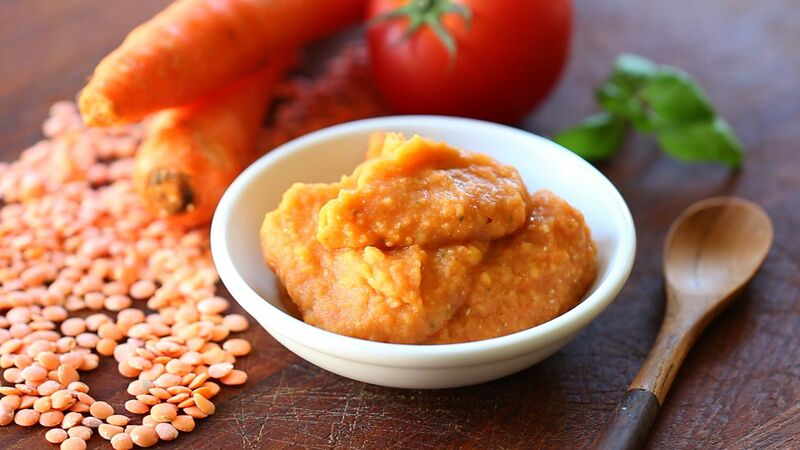 If your baby is not yet into meat, lentils are a wonderful vegetarian solution to give proteins to your little one. They are very very rich in iron. Iron is essential for your baby to keep blood and brain cells working. By the age of 6 months the natural storage of iron in your baby’s body (the one you gave him at birth) will significantly be reduced and that’s when you will need to increase it through food. In addition to that lentils are very creamy (babies love it!) and easy to cook (moms love it!). 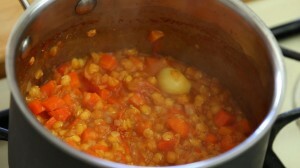 Why red lentils and not other varieties? 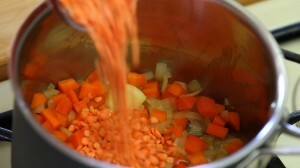 They cook faster and they almost dissolve once cooked in a smooth cream + they tend to cause less gas as other lentils. 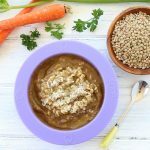 When to introduce in your baby’s diet lentils? At around 8 months. As they are very rich in proteins and fiber they might be difficult to digest for a 6 months baby. 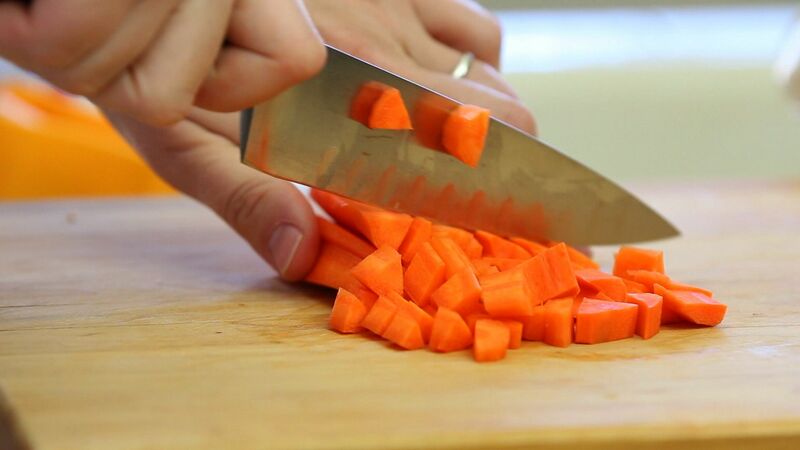 Prepare the veggies. Peel the carrots and chop them in small pieces, slice the half onion in small thin slices. Add the carrots and the onion in a medium size sauce pan. 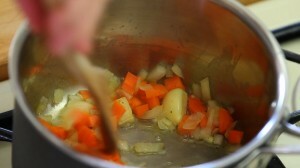 Add the garlic clove and 1/2 cup of vegetable broth. 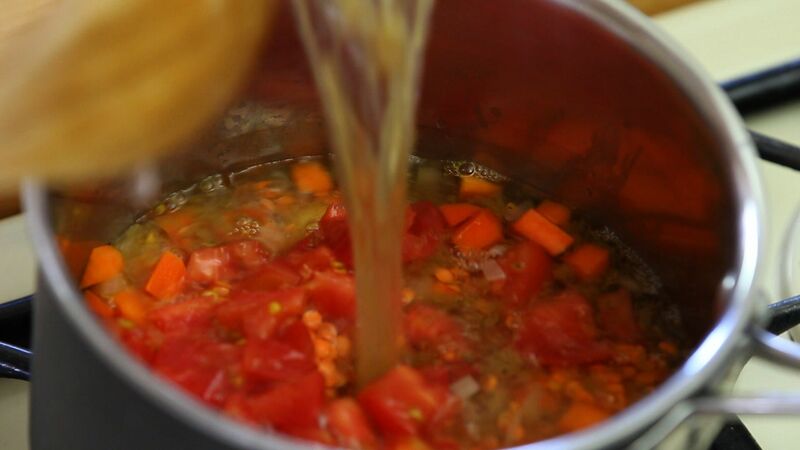 If you want to prepare a good homemade vegetable broth click here. Turn the heat on at medium and cook the veggies for 5 minutes stirring occasionally. 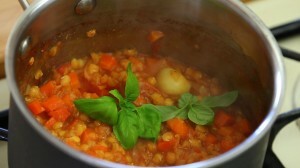 You want the vegetables to get tender and half cooked. Add the red lentils, the remaining vegetable broth, the fresh tomatoes chopped and the tomato paste. Stir and wait up until the soup is bubbling. That’s when you will need to reduce the heat at minimum and let the soup cook for 20/25 minutes, not covered and stirring occasionally. 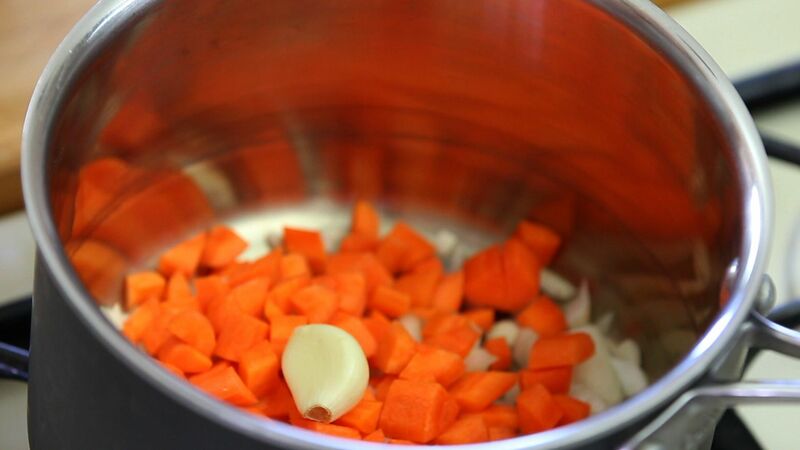 Basically you want the soup to cook and absorb the broth. 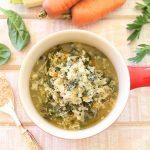 Turn the heat off and add the basil leaves. 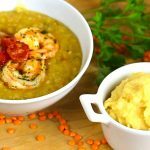 Why I particularly love this recipe? Because it can be a lovely meal for the rest of the family too. At this point, once the lentils are cooked, you can remove the portion that you want to transform in a baby puree and add some salt + oil of olive + parmesan cheese grated to the rest of the soup. 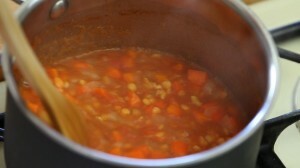 The adult lentils soup is ready! 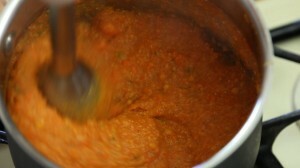 For the baby puree keep going using an immersion blender as I did or placing the lentils soup in a regular blender. Mix everything up until you will reach a smooth and creamy consistency. Add the parmesan cheese grated, the Extra Virgin oil of olive, stir and enjoy!!! 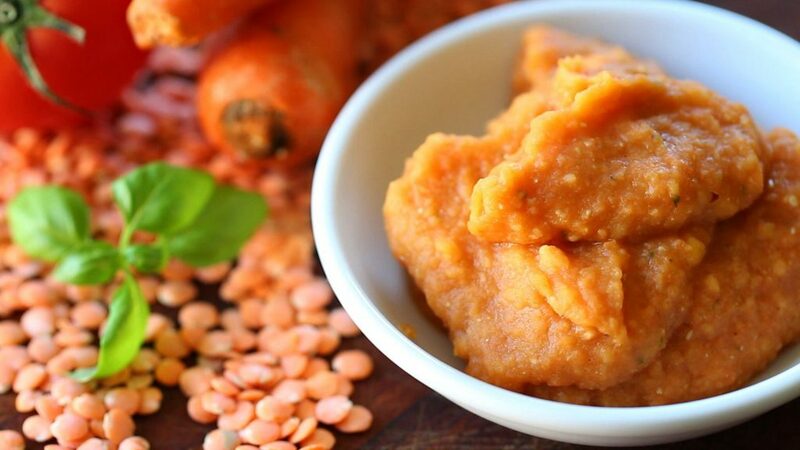 You can store the baby food in small containers and refrigerate them in the fridge for 3 days or freeze them for 4 months. My little Alex really enjoyed the puree!! thank you for recipes. 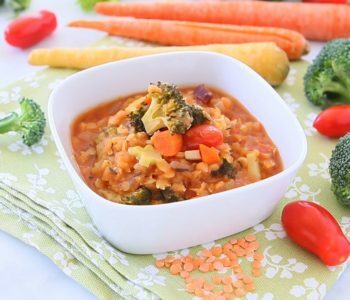 i would like to ask if i can give this food to my 7 month old baby. in one of your comments you noted that to give tomato after 10 month. my baby did eat tomato yet. can i give this food to her? thank you for watching BuonaPappa! yes, I suggest to insert tomatoes in a baby diet after 10 months because of their acidity. They might irritate your baby’s intestine that is still developing at that age. 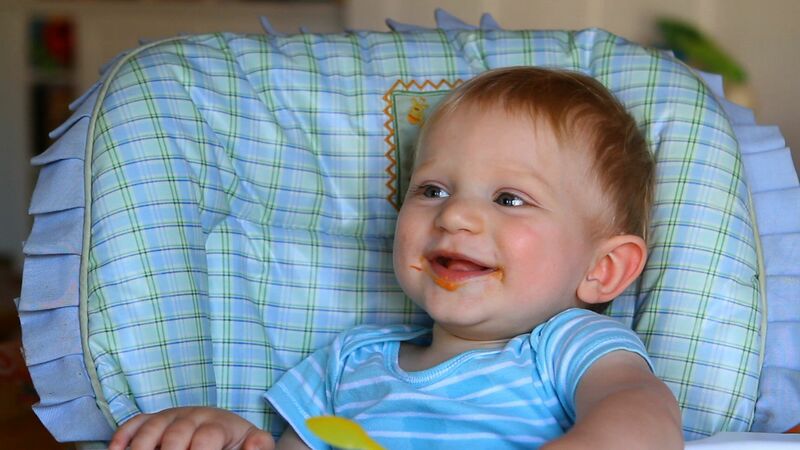 Every baby is different so your baby might react well to tomatoes (like mine did) or might be more sensitive. That’s why the general suggestion is to wait up until 10 months. For the lentils I would start at around 8 months because they are loaded with fibers and it might be difficult to digest for a 6 months baby. sorry did not eat tomato yet. I am sorry I dont know your name but I am really grateful to you. Thanks to you I enriched my babies menu. Good day. I hope you andbyour little cutie are safe and healthy. 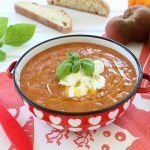 I would like to ask if I can add some potatoe instead of tomato? we are fine, thank you! 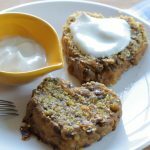 Thank you for this recipe my son loved it. I’m so glad to hear it, thanks!! I want to ask which cheez is good for baby ….to help gaining weight….right now i am using pizza cheese…mozrilla and chadder cheez together is it fine ???? Thank you so much for your wonderful recipes. As my son has become 7 and half month old, Introducing everything new to him is very exciting but at the same time, I’ve had a headache thinking so much of what and how to feel my little angel. Fortunately, I’ve found your website and it’s being my main source of cooking. I have a small question though. 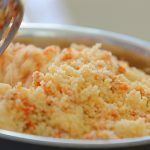 Is it really ok to give parmesan cheese to the baby? I’ve given ricotta and yogurt but I’m concerned with salt contained in parmesan cheese. Personally, I love all kinds of cheeses, so I’d be so happy to introduce them slowly to my baby. In addition, is olive oil a must for baby food ? 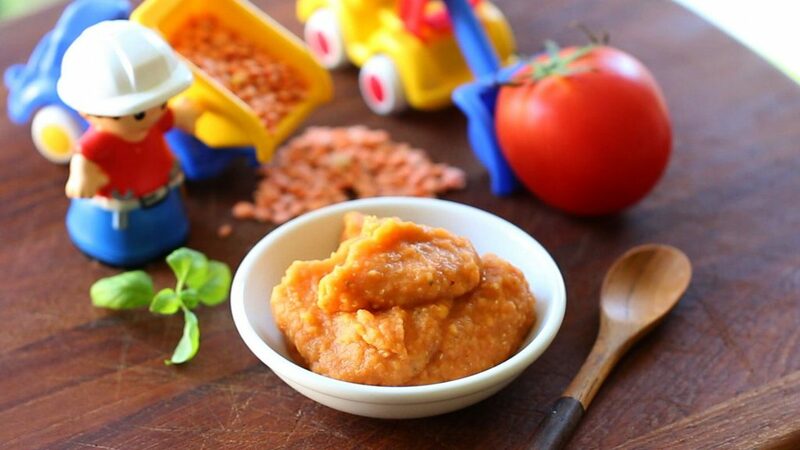 Since I’m originally from Korea, living in Lebanon, I’ve learned very diversified recipes for baby foods. 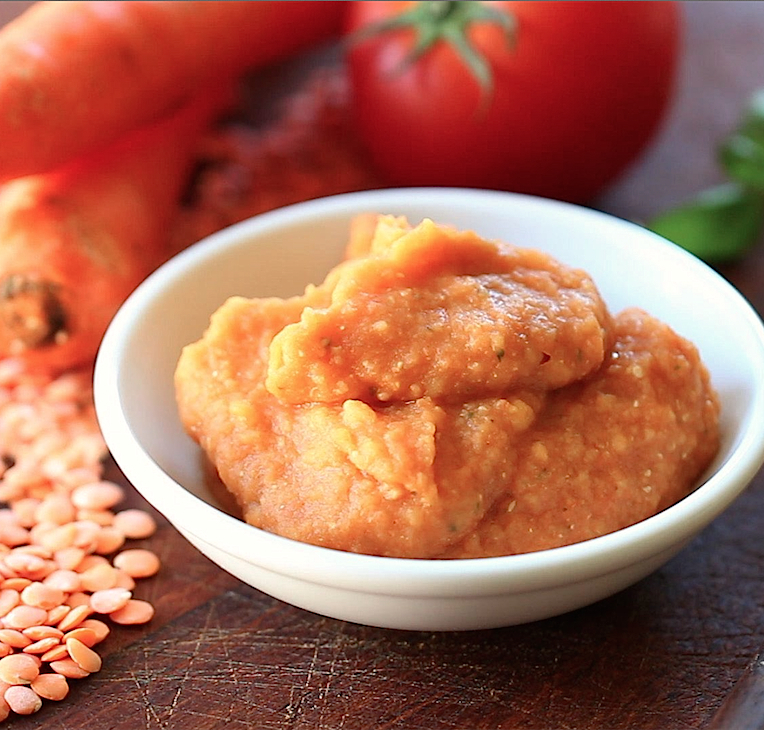 It’s amazing how all cultures and countries have their own version of baby food, yet all nutritious and important. 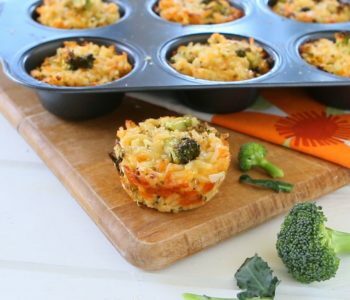 For an instant Korean mothers would never add cheese and vegetable oil to their babies’ diet, they focus on various vegetables combined with rice and meat. Thank you so much for watching BuonaPappa and I’m so glad I can give you some new ideas for preparing your homemade baby food. Parmesan cheese. Yes, you can give it to your baby starting from 6 months. It is an aged cheese, it means that during the process of making it the quantity of lactose is reduced almost to zero. 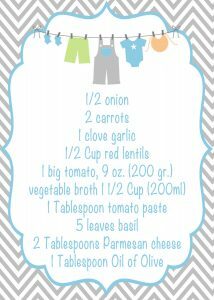 Parmesan cheese contains salt (it is basically made with milk and salt) but the quantity that you add in a baby recipe is very very low. Usually it’s only 1 teaspoon. 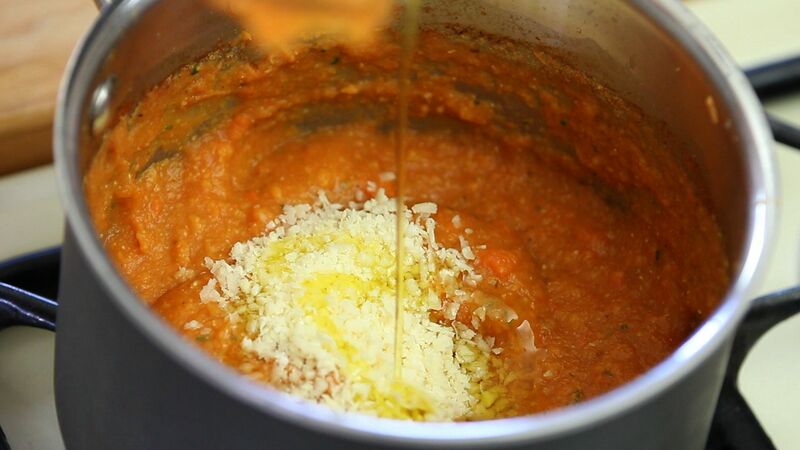 The amount of salt contained in 1 tsp of Parmesan diluted in the overall amount of baby food that the recipe requires is not something to worry about. Before giving salt (in form of Parmesan cheese) to my kids I did some research. Both the Italian Pediatric Association and the World Health Organization suggest to give salted food to babies from 6 months up “with moderation”. In this case “moderation” is the key. On the contrary I suggest not to add any pure salt (not even a pinch) to baby food up until 2 yrs as salt is already contained in the other ingredients like in Parmesan. Olive Oil. 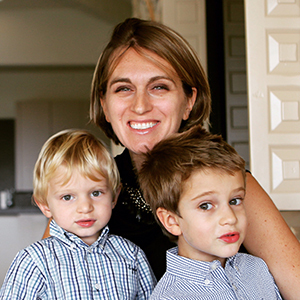 It’s highly recommended by Italian pediatricians for many reasons. Contains good fatty acids needed for your baby’s growth and oleic acid (the same one contained in breast milk). It is very easy to digest and makes baby food creamier and tastier. Extra Virgin Oil of Olive is the one you should select for your baby food (and not only, hi hi!). Pure and not processed.Lebanon has a wonderful variety of high quality oil of olives! I totally agree with you. I’ve done my research about baby food around the world and every culture has its own habits. Being Italian I’ve been following the Italian baby food tradition. 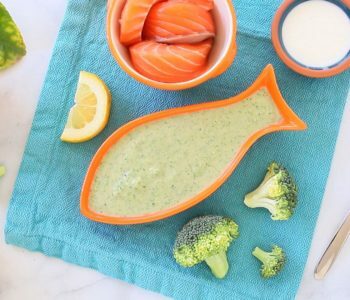 I always respect other food choices and I’m always open to learn new baby food ideas. What I deeply suggest is to use seasonal, fresh, local and organic ingredients for your little one (and for the rest of the family too!!) Delay the usage of added salt and sugar as much as possible. Avoid fried foods: your baby’s liver is not ready to process it. Thank you so much for detailed and very useful information. I hope your children are fine. 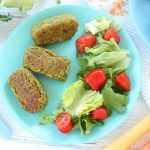 Beirut is having a big change in weather, which brought my son a running nose..cYour recipes have been a great help to me. 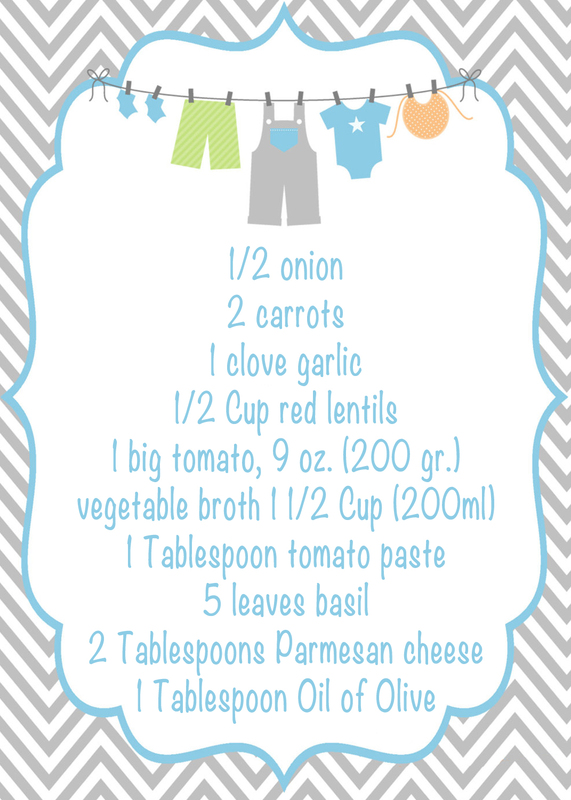 Even though tomatoes are recommended for the babies older than 10 months, I started giving it to my son a week ago and he didn’t have any bad reactions such as diaper rash or diarrhea. I assume I can keep adding tomatoes to his diet, or should I wait ? Thank you again and have a good day!! Thank you so much!! 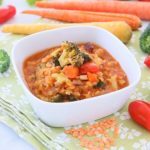 I made this delicious red lentil dish for my son today and he loved it! I made enough amount to keep in the freezer. I will try adult version of it next time for me and my husband~. Your children are adorable! !